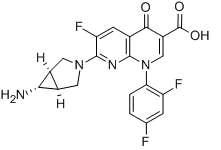 Trovafloxacin is a broad spectrum antibiotic that inhibits the uncoiling of supercoiled DNA in various bacteria by blocking the activity of DNA gyrase and topoisomerase IV. Aclarubicin hydrochloride is an anthracycline produced by Streptomyces galilaeus. It has potent antineoplastic activity. Rubitecan is a semisynthetic agent related to camptothecin with potent antitumor and antiviral properties. Rubitecan binds to and inhibits the enzyme topoisomerase I and induces protein-linked DNA single-strand breaks, thereby blocking DNA and RNA synthesis in dividing cells; this agent also prevents repair of reversible single-strand DNA breaks. Ellipticine hydrochloride is a potent antineoplastic agent; inhibits DNA topoisomerase II activities. Silatecan is a synthetic, highly lipophilic derivative of camptothecin, with potential antineoplastic and radiosensitizing activities. 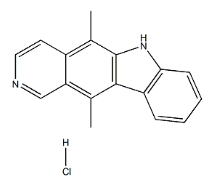 9-Hydroxyellipticine, Hydrochloride is a cell-permeable antitumor alkaloid that acts as a potent inhibitor of Topo II (IC50 = 3.3 μM). SN38 glucuronide is a pyranoindolizinoquinoline. Aclarubicin is an oligosaccharide anthracycline antineoplastic antibiotic isolated from the bacterium Streptomyces galilaeus. Aclarubicin intercalates into DNA and interacts with topoisomerases I and II, thereby inhibiting DNA replication and repair and RNA and protein synthesis.